Chronicles all my travels, vacations, holidays, package tours, weekend getaways and road trips that I've enjoyed, with plenty of pictures. Last weekend, being a long holiday weekend (13th to 16th August), we decided to make a short leisure trip to Bangalore City for three days. It had been raining incessantly in Mumbai for the last whole month making it impossible to move out much or do anything else. Getting bored of being stuck to the house caused us to think of taking a short break away from home for a while and the closest place that we could get relatively cheap air tickets at such short notice was for Bangalore City via Kingfisher, for which I am a Club Member. 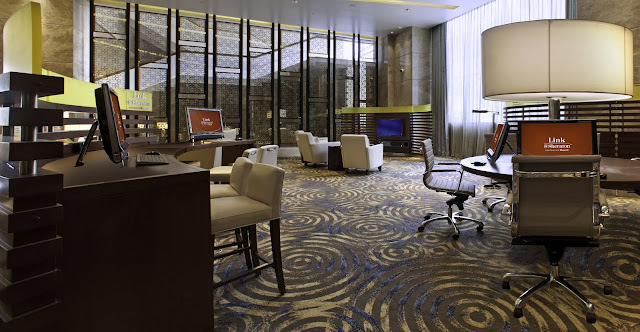 So without further ado, we booked our flights and then did come research online on the hotels where we could have a comfortable stay.That's when I came upon Sheraton Hotel Bangalore. 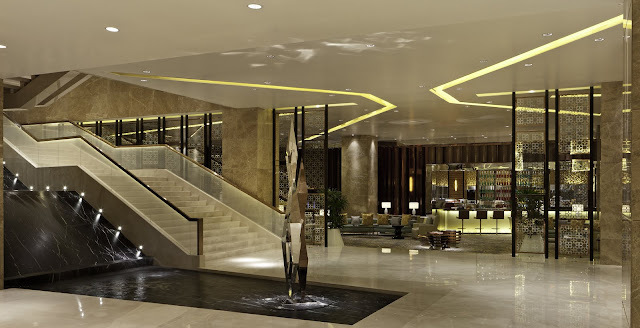 The Sheraton Hotel is part of the Starwood hotels and resorts worldwide and to my surprise, I discovered that they are have a partnership with the Kingfisher, my preferred airlines, wherein you can get extra Kingfisher miles for just staying in this hotel. This spurred my interest in choosing to stay in this hotel. Sheraton Hotel Brigade Gateway, Bangalore. I visited their official website online to check out the features and facilities offered by the hotel and to also check out the rooms available and their tariffs. That's when I discovered the "Starwood Preferred Guest" program where you can easily apply to be a member and get a membership card for free. Apparently, this membership earns you "starpoints" for all of your eligible stays at over 1100 Starwood hotels and resorts in more than 100 countries. These points can then be redeemed for Free Night awards. I applied for the program and got a card instantly. The room rates were reasonable and cheaper than the other five star hotels that we had checked out. So we went ahead and booked a room for three nights. 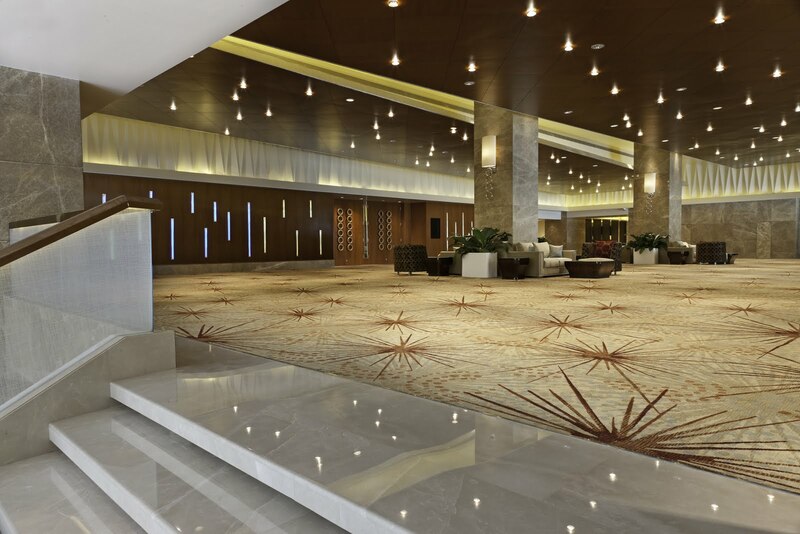 The Sheraton Hotel at Bangalore was opened quite recently in the month of May 2011 and is located in Malleswaram on Dr Rajkumar Road, Rajajinagar. 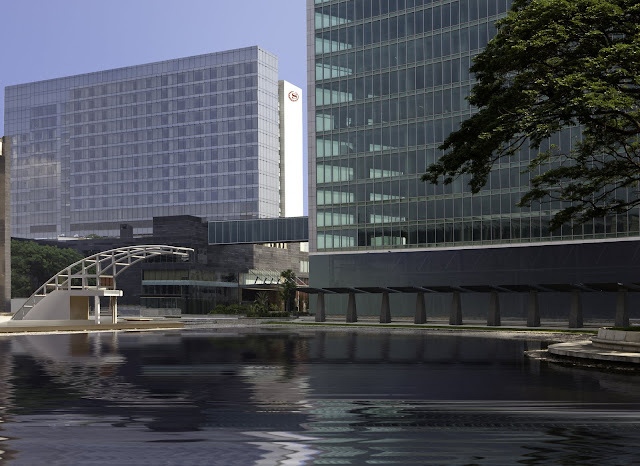 The Hotel forms a part of the expansive Brigade Gateway lifestyle enclave comprising of the World Trade Center office tower, the massive Orion Mall and Multiplex, green space, a man made lake and is also connected to the World Trade Centre (WTC) and the Orion Mall via a sky bridge. 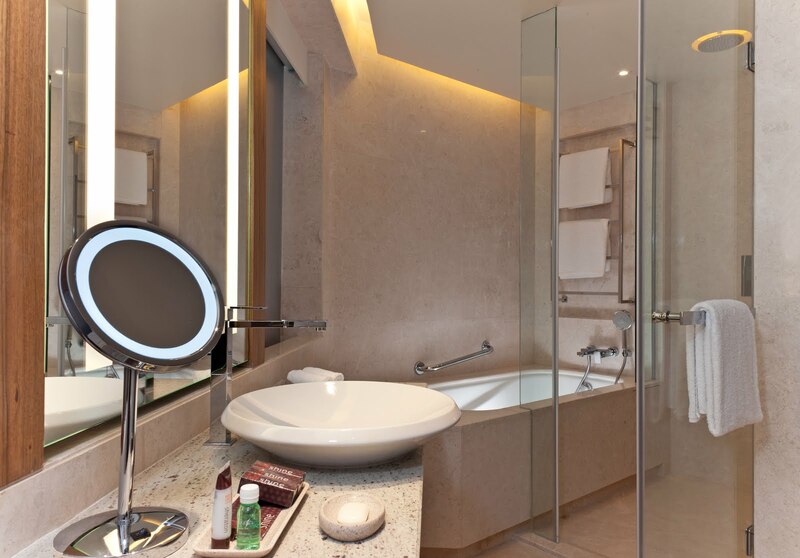 All in all, the whole property looks pretty impressive and stylish as per international standards, has all the comforts, easy accessibility, suited to the business class and is also very futuristic in its design and facilities. It is situated about 34kms away from the airport, and so it took us about 35-40 minutes by cab to reach it as there was little traffic on the roads late at night. All the other important places like the city center, Golf club, Bangalore palace, Cubbon park etc are within 10 kilometers of the hotel. One can use the hotel travel desk for transportation or use the city cab services. However, for unplanned movement, it was also very easy to catch an auto rickshaw during the day (which is the preferred mode of cheap local transport in the city) from right outside the Hotel. View of Sheraton Hotel from the man made Lake. The Sheraton Hotel is an ideal destination for both business and leisure and the stay is definitely a lifestyle experience. We found ourselves booked into the deluxe pool facing room on the 10th floor, which offered a fantastic view of the pool, the man made lake, and the iconic ISKCON Temple that's located nearby. We were given the King size bed as per our choice, which was big enough for all three of us to fit in very comfortably, and therefore we did not require an extra bed for my son. 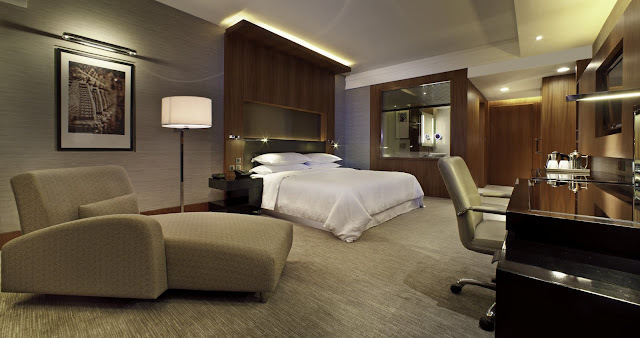 The room was very comfortable and spacious, offering all the world class amenities in it. See Pictures below. View of Iskon Temple from the Pool. View of the pool from our room on 10th floor. The grandeur offered by the hotel is visible the moment you enter the lobby with its high atrium and the walls decorated with motifs inspired by India's culture. On the left side is a water body with flowing water right next to the staircase going up to the ballroom level. The water theme continues on to this level and the large pre-function area has a ceiling decorated with crystal beads of light. 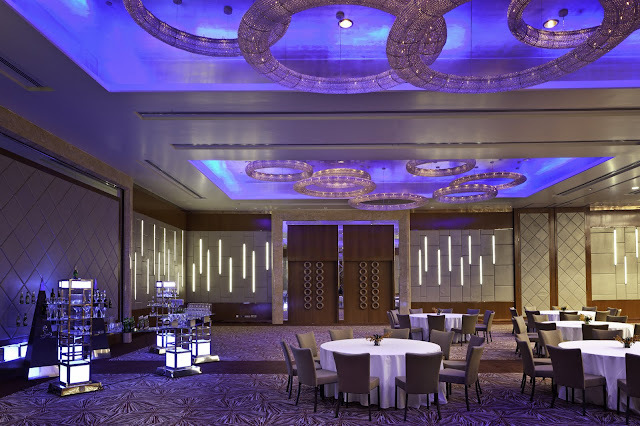 Expansive is the word when it comes to the Ballrooms/various banquet halls, there are nine of them, suitably provided with wireless internet and audio-video equipment. On the right side of the entrance, a custom made lighting fixture with a blue/clear crystal combo catches the eye even though it is higher than the eye level, leading straight up to the reception. The staff was cordial and very helpful and checking in was a breeze. The lounge opposite the reception is well thought out with nice furniture making one feel comfortable unlike some other hotels where one feels like they are in an airport lounge. Across the lounge is the Link@Sheraton area, something like a business center, with wireless and regular connectivity. Developed in partnership with Microsoft, guests can use the facility for connectivity, printouts etc. While we were there, the first 45 minutes of use was complementary. Feast, the signature multi-cuisine all day restaurant was where we had our breakfast daily. The restaurant is tastefully done with colors, indoor plants and fixtures melting into each other in the natural daylight streaming in through the high glass windows. What I found unique about this restaurant was that it was thoughtfully divided into different islands to cater to the different cuisines namely, Indian, Asian and Western dishes and each island was manned by their respective chefs who offered to cook your choice of food exactly the way you would want it. The choice available was such even after three breakfasts there were certain items we had not tried yet. During our stay, we managed to try their dosas (which were perfect, by the way) and the stuffed parathas, choice of eggs with toast, noodles of our choice cooked with a mixture of our own choice of vegetables, and non veg items that were on display, and also tasted some of the different types of bread, puffs and pastry along with fresh juice, tea and coffee. The food was delicious and the staff very friendly and helpful all along. Another unique feature of this restaurant is the ice cream island, where one can just go "nuts" and invent an ice cream of your own choice served on a cold grill with any type of fillings, toppings, condiments and mixtures that you want, called the Ice Cream Teppanyaki , the first of its kind in Bangalore. It's definitely something you wouldn't want to miss. Durbar, a colonial styled bar, offers a varied range of beverages and snacks. Themed on the Indian royalty of yore, the interiors give a royal and plush look complemented well by the Maharaja sofas and the bed style seating. 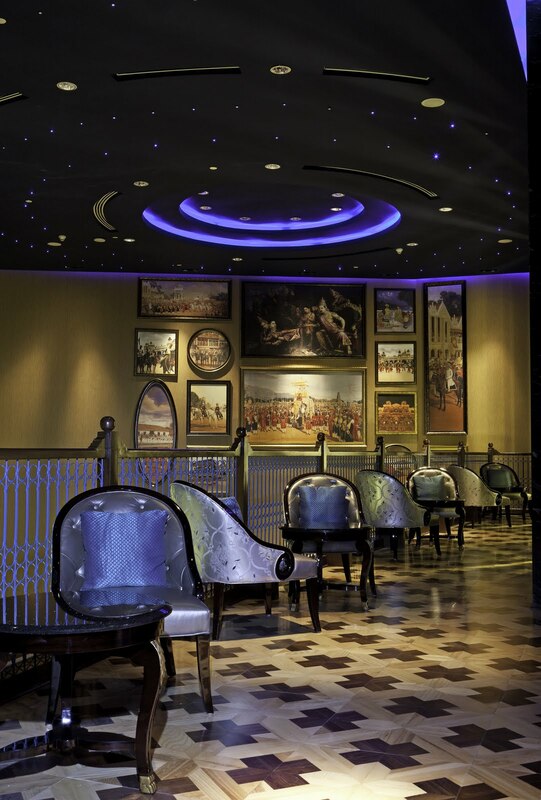 The opulence continues on to the mezzanine floor which also houses a private dining area. We just missed the saturday night special discount offer of drinking and tasting unlimited Brazilian malt for just Rs/-1000 per head. This special scheme will get over on 30th September, so if you are looking for a cool place to chill and indulge then this is probably where you should be headed. And don't miss the WOW (wines of the world) tasting opportunity, where they have a huge collection of imported wines of all varieties right in front of your eyes that you can choose to taste. The place is aptly decorated to make you feel "royal" in every way, including the huge paintings from the royal patronage to suit the mood. See Pictures. The level four of the hotel houses Bene, the signature Italian restaurant. We are not much of Italian food fans and hence skipped the opportunity to dine there. The restaurant offers a variety of soups, salads, pastas, pizzas and cheese. 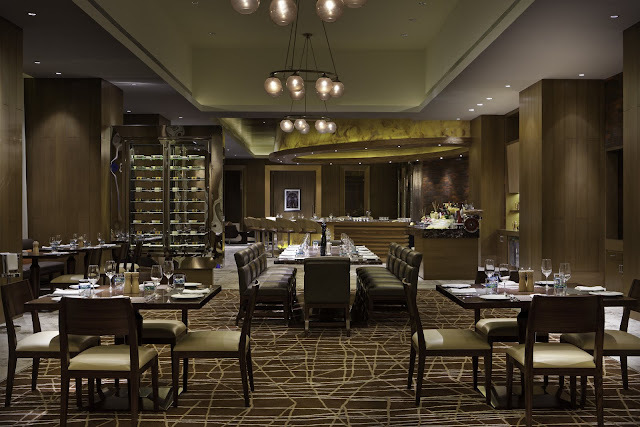 For those who mix business of eating with the pleasure of drinking, the restaurant has a delectable selection of wines and draft beers to choose from. For kids they have an equally lavish choice of a variety of sodas, milkshakes and desserts. Adjacent to Bene is the Persian Terrace, an open air restaurant, set to a mid-east theme. Shimmering lanterns, candles, twinkling tea lights, cabana sofas, cane chairs, stone floors, a Persian fire wall reminds one of the Arabian Nights. The Arabic and Lebanese cuisine completes the experience. 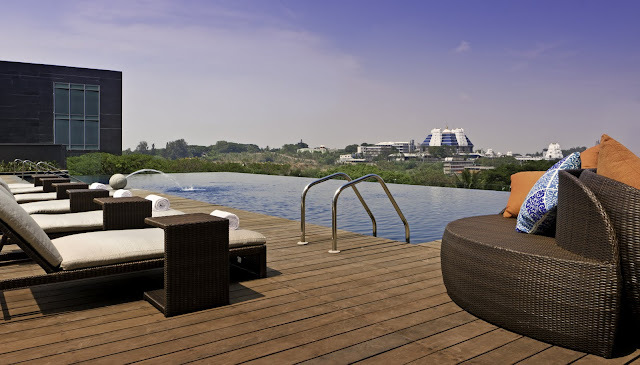 For the weather, such as in Bangalore, the concept and the implementation clearly is one of the highlights of the Hotel. The fourth level also houses the swimming pool, the Gym and the Angsana spa and is certainly the most happening space in the hotel. To sum it all up, Sheraton, Bangalore has all that it takes for an enriching stay away from home. A helpful staff, elegant decor, a spacious room, an inviting bed and appetizing food. What else do you need for your stay to be worth cherishing.